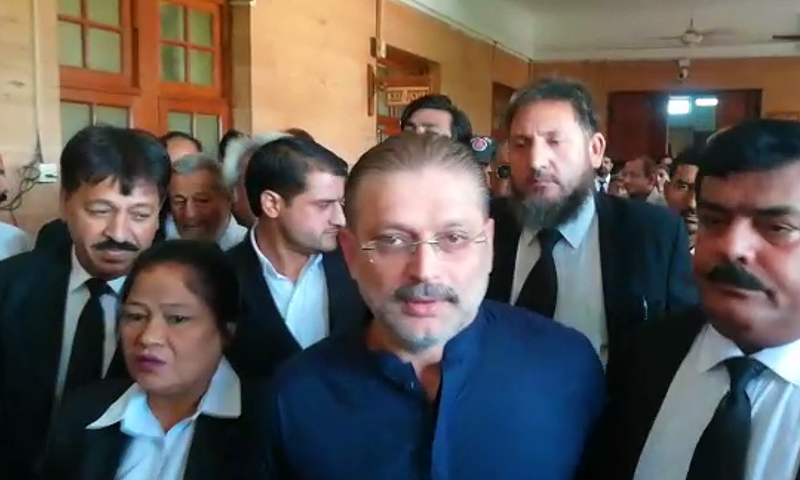 Sharjeel Inam Memon at Sindh High Court on Monday. The Sindh High Court (SHC) on Monday rejected former Sindh Information Minister Sharjeel Inam Memon's bail in a corruption case — pertaining to alleged awarding of advertisements at exorbitant rates — after the National Accountability Bureau’s (NAB) special prosecutor completed his arguments. Headed by SHC Chief Justice Ahmed Ali M. Shaikh, a two-judge bench rejected the PPP leader's bail application along with the applications of 12 others accused in the case. The bail of one of the accused, Riaz Muneer, has been accepted by the court. Previously, all of the accused in the case, including Memon, had procured pre-arrest bail. In a previous hearing of the case, NAB had said that the investigation was conducted regarding corruption and corrupt practices in the advertisement awareness campaigns on TV channels and FM radio between July 2013 and June 2015, and it was found that the accused acted with the connivance of each other resulting in losses to the national exchequer. According to DawnNews, it is illegal to arrest an accused within the premises of the SHC; however, a NAB team has been posted outside the court to arrest Memon as soon as he exits.